I am almost done with my skydiving posts. Now back to our Ride Thailand trip, stories of which are by and large untold. If you're reading this post on any website other than my blog, www.enidhi.net pls let me know by dropping a comment. This happened during the day 3 of our ride Thailand trip.. What was supposed to be a 400 km ride turned out to be a 530 kms late night biking expedition, somewhere deep in the jungles of northern Thailand. We were heading from Mae Hong Son to the border town of Mae Sot. We had our lunch at Mae Sariang and proceeded further towards our final destination by about 2.30 PM. By now we had covered the legendary 1864 curves in the province on bike and had another 230 kms before we reach our destination for the day. Above: A temple near the entrance of our lunch town, Mae Sariang. Here we were supposed to change direction to Route 105 from Route 108. Our post lunch ride started and we cruised across the curvy highway with ease. The scenic ride continued and the clock was ticking. A few signages said this road will take us to Chiang Mai. Which was odd but didn't ring a bell to any of us then. After riding for over 60 kms, we pulled over and our pilot and guide, Sumon communicated to us that we need to go back. Enthusiastic bikers that we were, we didn’t whim a bit and followed him back. In this process we covered few hundred more curves and spent another hour or so riding. Thus we rode back, all the way to Mae Sariang. (Point B in map below) This implied we have covered 120 kms more and probably another 200 extra curves. 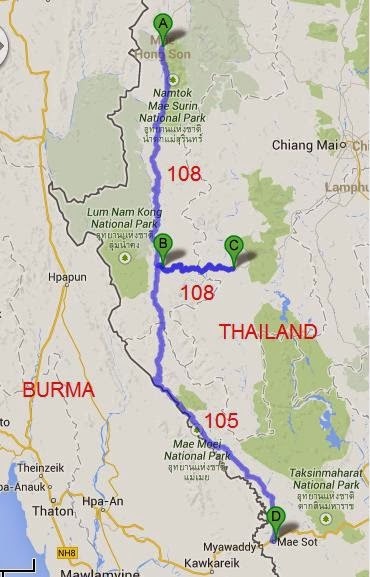 As you see in the map below, we were supposed to change to Route 105 post lunch at Mae Sariang. However, we wrongly continued on Route 108, which was a mistake. Probably there were few other routes to reach Mae Sot without having to take a detour, but Sumon decided that the best option is to go back and take the right path. Our support teams were headed on the right direction and they almost reached their destination while we were back to our lunch point. It was evening by then. We fueled up and then started on the right direction this time. We had more than 230 kms to cover. While Sumon said sorry for guiding us through the wrong path, we had no idea what was awaiting us for rest of the evening. Map below for your quick reference. Point A is Mae Hong Son from where we started, B is Mae Sariang where we had lunch, C is a point on Route 108 till where we headed wrongly and then took a U turn, Point D was our destination for the day, Burmese Border town of Mae Sot. B to C was the 60 kms one way wrong stretch we covered. Notice how close the highway is t Burma border, between Mae Sariang and Mae Sot. Now that we were on the right direction, the idea was to cruise and try make up for the lost time and distance. But few kms into the ride, we could see the sun settling down. Myself and Niranjan couldn't resist stopping for a moment, to click few snaps. We continued riding. It was getting dark and tiresome. The road was largely deserted and fairly wide. Suddenly the road conditions changed. The smooth roads turned rocky and dusty. Now it feels like India- we told ourselves. We had to slow down heavily and ride with caution. We kept riding keeping adequate distance between bikes, so that dust gets some time to settle down. We were still a 100 kms away from the destination and road showed no signs of improvement. We were riding since 8 AM in the morning without too many breaks and our legs started demanding some rest. We were riding in a team and it is not a good thing to hold up entire team just because you want some rest. So most of us kept going. One of the expert and professional biker in our team, Joshua crasto sensed the mood, rode up to the pilot and suggested a break. We pulled over to relax for a while. That's where I took some of the below snaps. We were somewhere deep inside the forest, very close to border. No other vehicle in sight and no idea if forest has wild animals. Were there any naxal or militant equivalents? No idea. But there was no reason to fear. We stretched our legs, exhausted whatever little water and snacks we had and got ready to continue our ride. A truck driver came in from opposite direction and Sumon exchanged a few pleasantries with the driver and learnt about the road condition ahead. As we surged ahead, road condition improved intermittently but turning bad before we could feel relaxed. Once we had to negotiate a large group of buffaloes as well- had one been careless, it was too late for a ride to spot them in a turn in pitch darkness, but Sumon, who was leading, cautioned everyone whenever we had obstacles around. 20-30 kms before destination, we took another break. I lied down flat on the road itself. It is where I took the below photo, which came out very well to everyone's satisfaction. Few good memories like this made the ride worth, however long and tiresome it was. As we rode to the resort at Mae Sot, Mr Buddhani waved us in, signalling successful completion of a ride which was longest in our trip for a day. It was about 10 PM. We quickly had our dinner and went to bed, calling it a day. One wrong detour that made it a memorable ride! The construction of the temple is different.. Very nice.. Thanks for sharing..